This is what it means to love someone. This is what it means to grieve someone. It’s a little bit like a black hole. It’s a little bit like infinity. To last summer, when her grandfather Grey died. To the afternoon she fell in love with Jason, who wouldn’t even hold her hand at the funeral. To the day her best friend Thomas moved away and left her behind with a scar on her hand and a black hole in her memory. Although Grey is still gone, Jason and Thomas are back, and Gottie’s past, present, and future are about to collide—and someone’s heart is about to be broken. 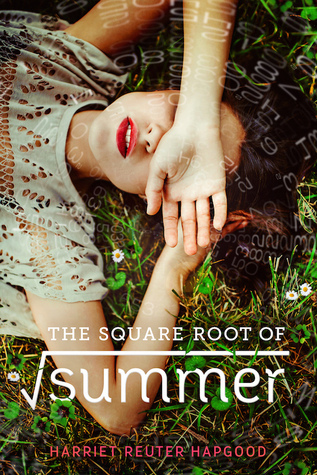 Harriet Reuter Hapgood’s The Square Root of Summer is a mathematical, imaginative, descriptive take on time-travel, love, and fate. Gottie H. Oppenheimer is spending her summer before senior year at home with an inattentive father, exuberant brother, a ginger kitten, and a boy- Thomas- who moved to Canada when he was 12. Her previous school year was all grey and muted due to the passing of her Grandfather- Grey- and the ignorance of a boy- Jason. She barely functions, going to school, completing her work, going home- she doesn’t have any friends.But with the reappearance of Jason and Thomas, she is forced to remember her life last summer and memories of her and Thomas. Something weird happens during the last week of school, she is thrown back in time to previous memories. But she starts to lose time in the present. Since she is a smart student, basically a genius, she analyzes these breaks in time through the lens of different theoretical quantum physics. Through her analysis, you experience Gotties heartbreak, loss, and understanding. Hapgood’s use of expressive language is genius. It brings the passages to life and readers have a great understanding of what Gottie is feeling in those moments. “‘Let’s try to focus on reality…’ Good luck with that. It’s the last week of term, and the atmosphere is as fizzy as carbon dioxide.” I mean who can’t picture the air around them fizzing with soda. Using this descriptive language, Hapgood is able to weave complex mathematical theories into a story, where at it’s heart, is about family, friendships, acceptance, and love. Gottie H. Oppenheimer (love her last name) is a sweet character going through some tough life challenges. Specifically, her grandfather’s death, her understanding of her relationship with Jason the previous summer, the appearance of an old childhood friend and why they never wrote to each other. Over the past year, Gottie has forgotten herself, become invisible. She isn’t who she was and Thomas’ appearance is really questioning who Gottie is and what she wants. By going through these wormholes, Gottie is seeing herself- who she used to be, what people meant to her, what she meant to people, and how she wants to get back to being herself. But in order to come out of the grey, into the sun, Gottie has to face herself and her past. I absolutely adored this book and wanted to get my hands on it from the moment I read the synopsis. I love stories about time-travel, self-discovery, and romance. This is the first book I’ve read where the time-travel is explained through theoretical quantum physics and mathematical equations. And, what makes this book exceptional, it was easy to understand and comprehend. I’d like to thank NetGalley and Macmillan Children’s Publishing Group for giving me the opportunity to read and review this ARC. Receiving this ARC for free does not sway my review.